Antigua Retains Title of Best Honeymoon Destination at World Travel Awards. 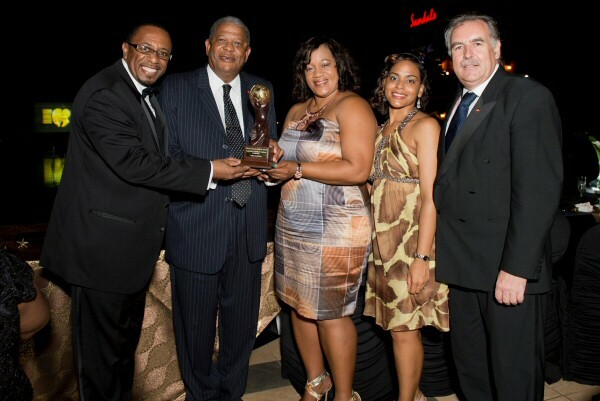 The twin-island state of Antigua & Barbuda confirmed its title as the ‘Romance Capital of the Caribbean’ when the destination was conferred as the “Caribbean’s Leading Honeymoon Destination” at the 20th Anniversary of the World Travel Awards Caribbean & The Americas Gala Ceremony held on September 14th 2013. The elite travel awards event which is known as the “Oscars” of the travel industry recognizes and awards excellent performance throughout various areas of the world travel and tourism industry. By winning the WTA for the “Caribbean’s Leading Honeymoon Destination” it automatically affords Antigua & Barbuda the opportunity to be nominated within the same category at the WTA Global Awards. This is an accolade that the destination will be striving to coup from its Caribbean competitors. In addition to winning the “Caribbean’s Leading Honeymoon Destination” a number of Antiguan hotel properties and businesses were also recognized at the prestigious gala ceremony including, Hermitage Bay, as Caribbean’s Leading Boutique Hotel, Carib World Travel was named Caribbean’s Leading Destination Management Company, Curtain Bluff Resort & Spa received awards for Caribbean’s Leading Green Resort and Antigua & Barbuda’s Leading Spa Resort. The Sandals Grande Antigua Resort & Spa was recognized as the Caribbean’s Leading Honeymoon Resort and Antigua & Barbuda’s Leading Resort, Ayers Creek Residences at Nonsuch Bay Resort received the award for Caribbean’s Leading Hotel Residences and Blue Waters Resort won Antigua & Barbuda’s Leading Hotel. The tropical landscape and natural beauty of Antigua & Barbuda with its beautiful secluded beaches and coves is the perfect backdrop for romance. This coupled with the destination’s easy wedding requirements, which allow couples wanting to get married to do so in less than 24 hours, make the destination the perfect paradise for any couple wanting to be wed. There are no residency requirements to obtain a marriage license and the paperwork is almost hassle-free. A couple can literally have a “same-day” destination wedding with numerous options available to accommodate every couple’s needs. Antigua and Barbuda have also received several accolades by both Brides Magazine and About.com as one of the Caribbean’s top destinations for weddings and honeymoons. The Huffington Post has also recently cited Antigua and Barbuda as one of the top five honeymoon destinations in the world. Receiving the top accolade of “Caribbean’s Leading Honeymoon Destination” also comes on the heels of Antigua & Barbuda hosting the two part finale episodes, including the Season 9 final Rose Ceremony episode, of the ABC TV Primetime Reality series ‘The Bachelorette’. The popular reality show has introduced the destination to millions of fans around the world and with formidable airlift to access the destination scheduled for the upcoming 2013-2014 winter season, Antigua & Barbuda is poised for growth.